Rose in Thorns: Soy melt invasion! A few weeks ago I finally launched a range of much awaited soy melts. If you haven't used them before, they are a small block of scented soy wax which you pop into your oil burner. 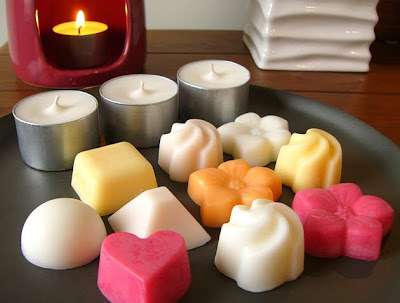 The wax melts to release the scent and fragrance the room. When you're finished, just let the wax set in the top of the burner. If you want to change the fragrance, just pop the burner into the freezer for ten minutes or so, and the wax should come out easily. I was testing them out in the week after the June 13 aftershocks, whilst I was also trying to dry out the carpet with the dehumidifier running 24/7, after the fishtank smashed and spilled water all over the floor. As anyone whose lived with wet carpet will know, it doesn't smell real good! The fragrance dispersed from the soy melts was enough to satisfactorily mask the wet carpet smell. Of course I can't guarantee they will disguise every smell, but they do a great job of improving the pleasantness of a room. I have a variety of scents and shapes, which I are available in two different sizes, and two different package options. 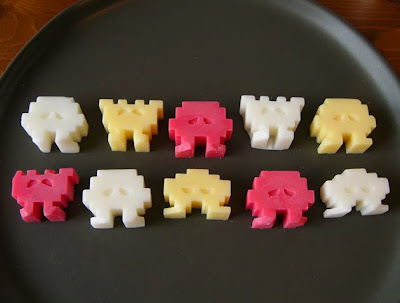 There are space invader shaped melts, and a variety of other shapes as well. You can purchase them from Felt in either a box of 8 (shapes) or 10 (space invaders), or a gift box with three unscented soy tealights, with a burntime of 8 hours each, and 10 (shapes) or 12 (space invader) melts. I haven't finished testing the length of time they last, but I would think about 20-30 hours. Once the scent has dispersed from them, you can return the wax to me to recycle, and receive my 10% recycling discount on your next purchase.